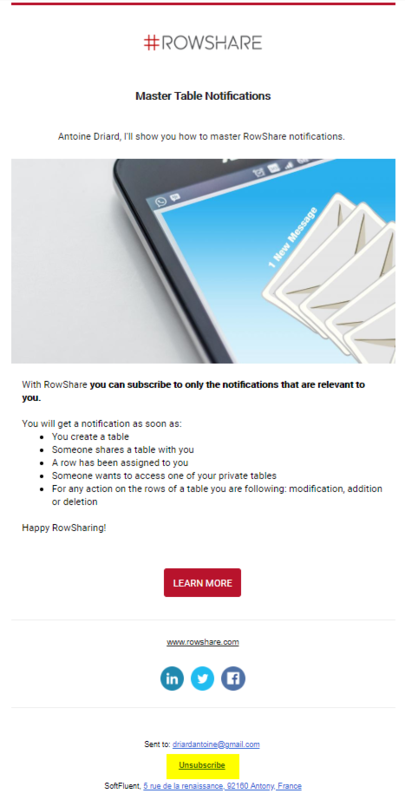 On top of System Notifications, Reminder columns and Notifications about RowShare tables, we also send you emails to promote RowShare key features as well as our best table templates. We do our best to send you emails of interest: if you have already created a HR table, we will send you information about HR tables only. If you already use a feature, we will try to avoid sending you information about that exact feature. But we also realize you might not want to receive such emails. Click the unsubscribe link ;at the bottom of any of these emails and you will never receive any of these marketing communications anymore.